The PRO 45 is a wide-range condenser microphone with a cardioid (unidirectional) polar pattern. It was designed for high-quality sound reinforcement and other demanding sound pickup applications. With robust construction and unobtrusive appearance, the PRO 45 offers versatile sound-reinforcement solutions for speech, theater, orchestra and choir sound reinforcement and recording. The microphone’s high-SPL handling is perfect for suspension over choirs and orchestras. The PRO 45 features a 25’ (7.6 m) permanently attached miniature cable with an XLRM-type connector, which allows it to be plugged directly into an XLRM-type jack or cable connector. The unit’s integral electronics can be powered from any external electronics can be powered from any external 9V to 25V DC phantom power source. 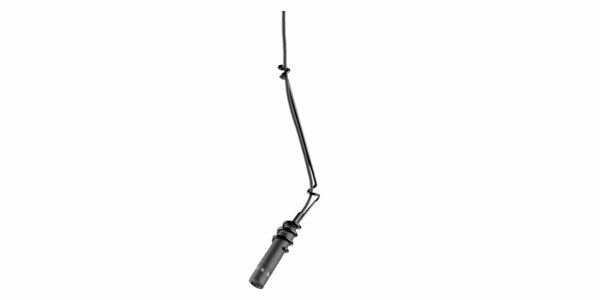 A flexible suspension-mounting bracket is included to allow for proper aiming of the microphone element for maximum pick up with minimum background noise.